Project for Public Spaces (PPS) was the public space consultant for the proposal for Seattle Civic Square, designed by architect Foster + Partners and landscape architect Atelier Dreiseitl. The one-block site, across from the new Seattle City Hall, would have accommodated office space, residential units, restaurants, retail opportunities and open space that would attract a diverse population and give new vitality to the neighborhood. This public-private partnership was developed by Triad Civic Center, LLC on City-owned property. 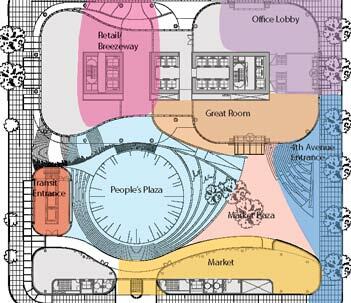 In the proposal, a tower housing the offices, residences, and ground-level retail occupies the northern edge of the block, and along the southern perimeter, a two-story retail building. Contained between these buildings, a new public plaza welcomes both daily activities and larger programmed events. Seattle Civic Square also serves as a transit stop for the city’s new light rail system. 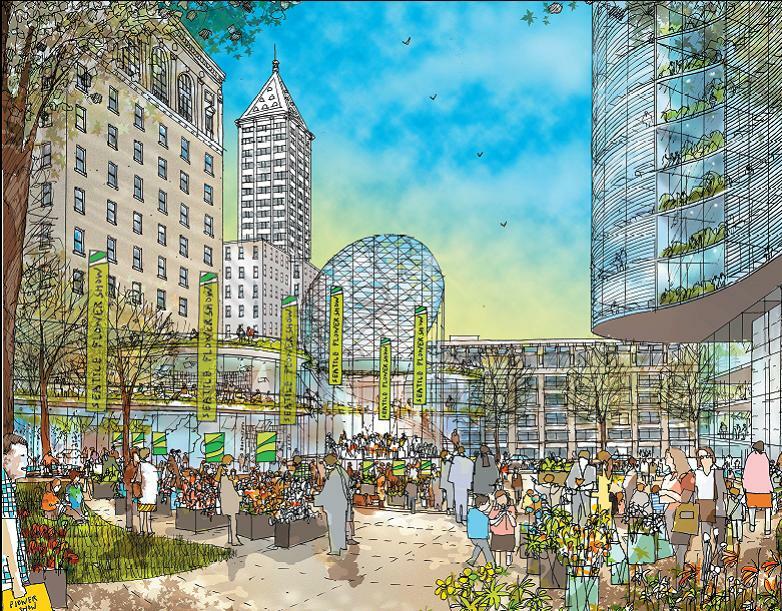 Located in the civic heart of downtown, the proposed Seattle Civic Square plaza would become a major destination in Seattle through thoughtful design, diverse programming, quality retail options and active management. The proposed public space would serve as the city’s front porch—welcoming all of Seattle’s citizens and visitors—as well as the catalyst that unites the surrounding downtown neighborhoods. It would provide valuable open space, a venue for the city to gather at civic celebrations and additional momentum to the transformation being experienced in the area. PPS engaged local stakeholders in the creation of an Activation Plan, which contains specific programming ideas for the 11 different public spaces of Seattle Civic Square for different times of the day, week and year. PPS is involved in ongoing design reviews in order to accommodate this detailed program and help Seattle Civic Square become a beacon of activity and life. However, the success of the Seattle Civic Square proposal as an active civic gathering space for the City of Seattle would depend, above all, on its management. This square would be the most actively programmed and managed open space in downtown, shared by a broader group of users and stakeholders. Using best practice models for public space management and input from key stakeholders, PPS crafted an Operations and Management Plan for Seattle Civic Square. This plan compares potential management structures for the programming and maintenance of the development’s public spaces and ultimately proposes a new non-profit organization. This Seattle Civic Square Conservancy would ensure that Seattle Civic Square realizes its potential and successfully meets the growing and evolving needs of the city.